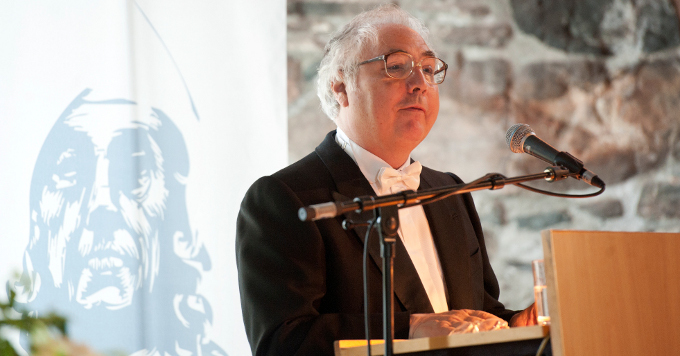 The Holberg Prize 2012 was awarded to the Spanish sociologist Manuel Castells. "Manuel Castells is the leading sociologist of the city and new information and media technologies. His ideas and writings have shaped our understanding of the political dynamics of urban and global economies in the network society. He has illuminated the underlying power structures of the great technological revolutions of our time and their consequences. He has helped us to understand how social and political movements have co-evolved with the new information technologies. Castells’ trilogy, The Information Age, offers a comprehensive theory of the global information-based society, associated with urban networks and media communications. His theoretical insights are grounded in continuing empirical research into the societal and technological transformations associated with media power. His most recent work, Communication Power, is an innovative analysis of the ways in which new media technologies can enable challenges to the concentration of media power, thus reconfiguring the political sphere. In his earlier work The Urban Question (1972) Manuel Castells questioned the dominant tradition that explained the form of cities by the operation of markets across geographical space. Instead, he argued that the underlying dynamics of urban life involved local struggles for political power. Castells argued that cities created “collective problems” that neither traditional capitalist nor classical Marxist models could account for. In The City and the Grass Roots (1983) he deepened this analysis of the city as the product of conflict between social movements and urban power elites. In the nineties, Castells’ attention shifted to the relation between globalization and emerging information technologies. His trilogy, The Information Age: Economy, Society and Culture (1996-98), deepens his continuing research into urban processes, economic transformations, technological change, and civic movements. The first volume, The Rise of the Network Society, had a major impact on our understanding of global informational capitalism. The Power of Identity analyzes the civic aspects of the network society in promoting organized resistance and new social movements. The final volume, End of Millennium, is devoted to the unevenness of the cultural transformations produced in different parts of the world in response to the new technologies. Castells’ latest book, Communication Power (2009), places the concept of power at the core of his analysis of the exercise of corporate power in culture, politics and society and the role of new media in exerting citizen power through social movements. Castells has taken thinking about “the political” to an entirely new level through his prescient account of the emergence of and interaction between new forms of power in the age of the network society." Manuel Castells is University Professor and Wallis Annenberg Chair in Communication Technology and Society at the University of Southern California (USC), Los Angeles and Professor of Communication at the Annenberg School for Communication & Journalism. He is, as well, Research Professor at the Open University of Catalonia in Barcelona, and Professor Emeritus, University of California, Berkeley. Holberg Lecture 2014: "Social Movements in the Internet Age"